If you're tired of white walls or just want to get rid of older, more toxic wall coverings, Dwell Studio's new delightful wallpaper has got you covered - or your walls covered so to speak. 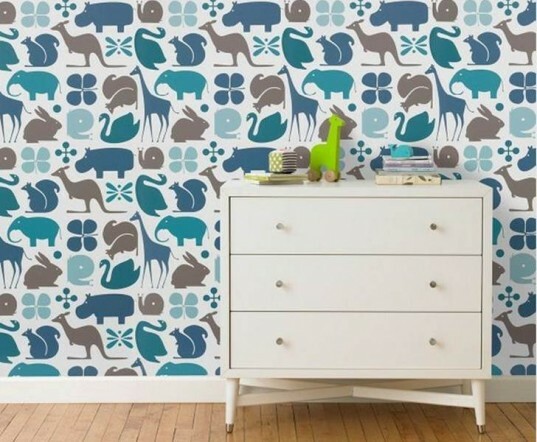 With plenty of colors and designs to choose from, this wallpaper is a sure fit no matter what your decor scheme is and will look great in any child's space - the nursery, bedroom or playroom. 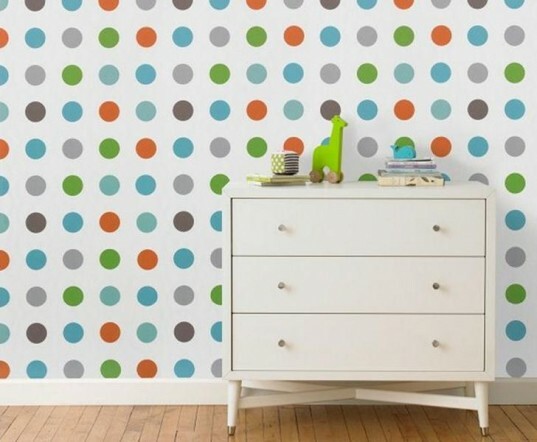 From pastel pinks to bold greens and blues to shiny and tantalizing shades of gray to lively polka dots, this is wallpaper that will wake up any space. 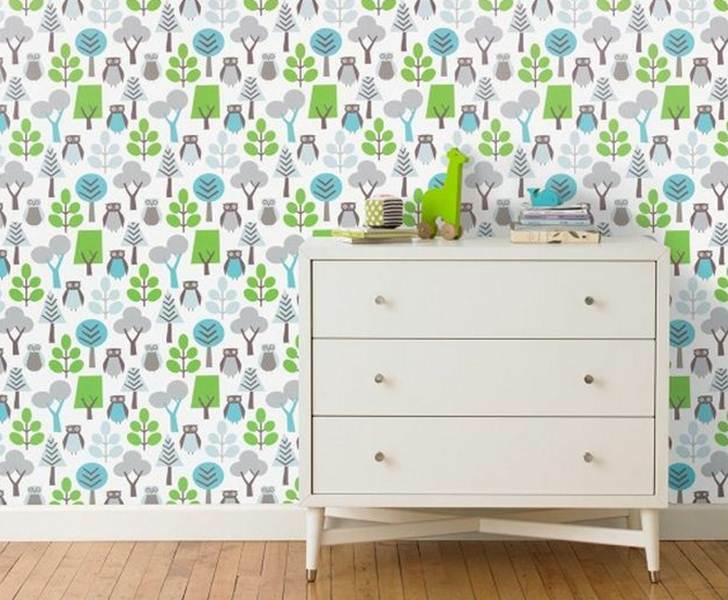 The fact that this wallpaper is eco-friendly is simply icing on the cake. Keep reading to learn more. Oh, and if you're wondering about the lovely dresser shown in the images, with the wall paper, it's the beautiful and modern Dwell Century Dresser. Wallpaper was a super popular home-decor staple in the 50s and 60s, but wallpaper of the past had some major flaws, such as being made with toxic chemical laden vinyl that pose a major health threat to you and your loved ones. Even today, many wallpaper samples, the vast majority in fact (96%), contain polyvinyl chloride (PVC) coatings. Plus, over half of all wallpapers contain one or more hazardous chemicals of concern, including lead, chromium, tin and antimony. Dwell’s new wallpaper is a much safer choice, environmentally friendly and 100% free from vinyl, PVC’s, POC’s and VOC’s. Instead of using harmful chemicals, Dwell makes their wallpaper with coated paper that has a dry adhesive on the back that is activated with water. Beyond being a safer wallpaper choice due to zero vinyl, PVC’s, POC’s and VOC’s, this wallpaper is fully breathable, even once on your wall and inhibits mold and mildew, which in turn can cut down on allergies, asthma risks and other heath problems. 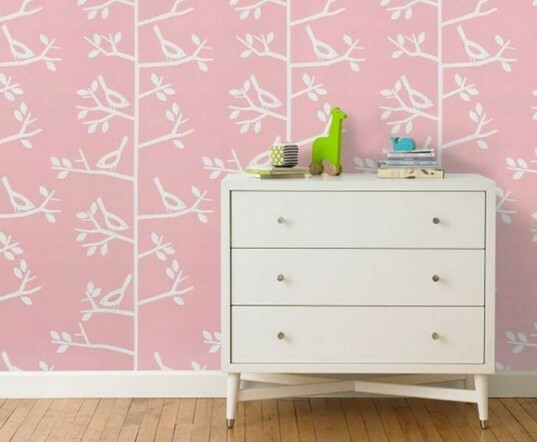 This wallpaper is safe for any room of your home, minus the bathroom. Dwell notes that this wallpaper material is not designed for high moisture areas or splash zones – you can however install this wallpaper over most other surfaces. Although a smooth surface is best because walls with texture may show through and give a bumpy appearance, it’s possible to install this wallpaper in most areas. Dwell’s new wallpaper collection is easy to care for. You can simply dampen a soft sponge or cloth with water and wipe it down. If you find yourself getting tired of the design, this wallpaper is easy to remove and won’t wreak your walls in the process. 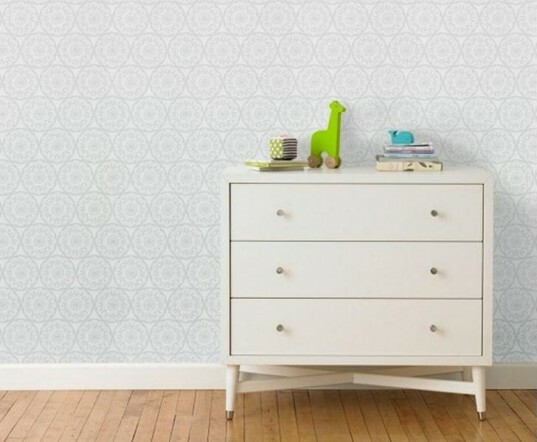 Dwell Studio wallpaper is available in 9’ x 24” and 13’ x 24” rolls. Your wallpaper will also come with thorough installation instructions for easy installation. Dwell reminds you that all computer screens tend to register colors differently and so they highly recommend ordering a swatch of your wallpaper before placing the full order in order to ensure you’re happy with the color. Wallpaper was a super popular home-decor staple in the 50s and 60s, but wallpaper of the past had some major flaws, such as being made with toxic chemical laden vinyl that pose a major health threat to you and your loved ones. Even today, many wallpaper samples, the vast majority in fact (96%), contain polyvinyl chloride (PVC) coatings. Plus, over half of all wallpapers contain one or more hazardous chemicals of concern, including lead, chromium, tin and antimony. Dwell's new wallpaper is a much safer choice, environmentally friendly and 100% free from vinyl, PVC's, POC's and VOC's. Instead of using harmful chemicals, Dwell makes their wallpaper with coated paper that has a dry adhesive on the back that is activated with water. Beyond being a safer wallpaper choice due to zero vinyl, PVC's, POC's and VOC's, this wallpaper is fully breathable, even once on your wall and inhibits mold and mildew, which in turn can cut down on allergies, asthma risks and other heath problems. 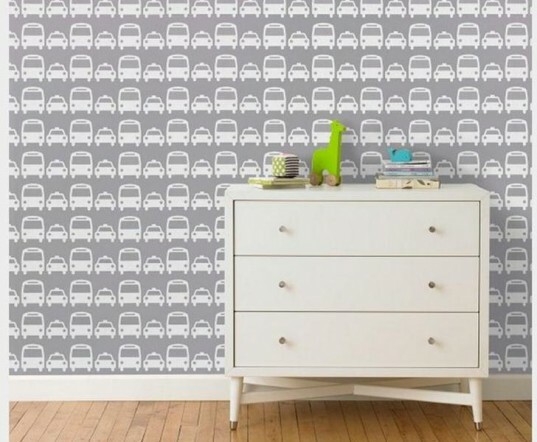 This wallpaper is safe for any room of your home, minus the bathroom. Dwell notes that this wallpaper material is not designed for high moisture areas or splash zones - you can however install this wallpaper over most other surfaces. Although a smooth surface is best because walls with texture may show through and give a bumpy appearance, it's possible to install this wallpaper in most areas. Dwell's new wallpaper collection is easy to care for. You can simply dampen a soft sponge or cloth with water and wipe it down. If you find yourself getting tired of the design, this wallpaper is easy to remove and won't wreak your walls in the process.